Matthew is the name of one of the Twelve Apostles that Jesus chose. 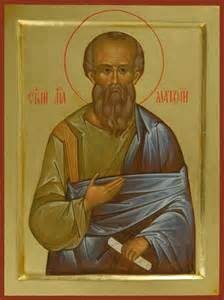 He was a tax collector (or more accurately, a tax agent) for the Romans (and therefore hated by fellow Jews), stationed at Capernaum. Jesus called him to follow him, just as he had done to Peter, Andrew, James and John, who worked in the fishing industry. Traditionally, Matthew was considered as the writer of the first of the four gospels, which as a result is called the Gospel of Matthew. The question is: can we rely on these details as being completely accurate? There are problems with some of them. For example, the tax-agent at Capernaum, called to discipleship by Jesus, is called Levi in Mark, but Matthew in the list of the Twelve apostles! Luke also lists Matthew among the Twelve, but does not tell the tale of the call of either Matthew or Levi! A puzzle! Nowadays most writers believe Mark’s gospel was the first to be written. 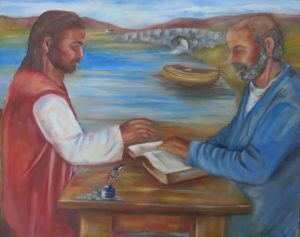 Matthew/Levi is an important figure in the gospels of Mark and Matthew, because whoever he was, he was instrumental in inviting Jesus to dinner, and to mingle with other tax-collectors and sinners. This caused scandal among the great and good of Galilean Jewish society, prompting Jesus to declare that he came to call sinners and not the virtuous, in the same way as doctors are not there for the healthy, but for the sick. A note on current thinking about the gospel of Matthew is important here. This gospel contains about 90% of the gospel of Mark unaltered. So, if Matthew’s gospel came first, it would mean that Mark edited down Matthew, missing out such gems as the infancy narrative, the Sermon on the Mount, and various post-resurrection stories. Why would any writer miss out the best bits? Many writers today consider that whereas the content of the gospel we call Matthew might have its roots in that apostle’s preaching, the actual writing did not take place until perhaps after AD 70, and after the destruction of Jerusalem and its temple by the Romans (September – October 70 AD), presumably after Matthew’s death. The reason for this claim is that Matthew’s gospel shows every sign of highlighting the teaching of Jesus as the fulfilment of the Law and the Prophets to such an extent that it looks like an attempt to bolster the faith of flagging g Jewish converts to Christianity who had been excommunicated from synagogues, disowned by families, utterly rejected for their belief in Jesus, and contrary to the teaching of the Jewish rabbis. Trier, Germany; diocese of Washington, DC; archdiocese of Asiago, Italy; Ortignano Raggiolo, Italy, Salerno, Italy; San Marco in Lamis, Italy; Villa d’Ogna, Italy; San Mateo, Ibiza, Spain.